69 Do you deserve to retire well? We ALL work soooo hard! But some of us get to live life and retire very well while many of us don’t. So, what’s the deal with that?! Understanding money is 90% behaviour and 10% technical knowledge. How do you know what you are doing with your money is the best decision for YOUR future? In other words, do you deserve to retire well? Or do you deserve to struggle? Yikes! So, I have a challenge for you! Practicing the ability to argue both sides of a very controversial topic. Understanding contexts, circumstances, life choices and career trajectories. The art of behavioural change. I started WWW because I see women finding themselves in extreme circumstances of not being able to financially support themselves. Balancing what you save for yourself and what you provide your (adult) children. The generation of looking after elderly parents and children. The trap of upsizing your lifestyle – homes, holidays, cars and keeping up with the Jonesses. The education needed to understand what you need to retire! We live in an age that information is abundantly available to us. We make so many assumptions about money! The biggest mistake we assume is that contributing a retirement fund is enough. It is NOT enough! You cannot rely on your company or your spouse to make the best financial decisions for YOU. It is the best time in this online world to make additional income. If you enjoyed this podcast, you will enjoy the dirty on debt, reasons why you should start a side hustle, and employee retirement funds. You’re welcome! Lisa Linfield: 00:03 Hello everybody, and welcome to today’s episode of Working Women’s Wealth. Every now and then you get put into a really interesting situation that stretches and challenges you, and makes you think about things differently, and mine was recently this last week. I’m doing a behavioral coaching program with a number of financial advisors, and it’s really stretching us, because at the end of the day, as I always say, money is 90% behavior and 10% technical stuff. And the question that we’re trying to answer is, how do you coach your clients through the decisions they need to make, as opposed to what was fondly termed as, client’s renting a solution that they don’t actually own? And that’s a really huge important thing when it comes to behavioral change. And so part of the training is these role plays, and in the role play we had to take a very strong opinion, and then the other person had to coach us basically through to the other side and make us see a different opinion. And it’s very much around trying to help you stand on both sides of the fence, and practice the skills of coaching clients when they have a very strong opinion on something. So the question I was asked to debate was, if you don’t have enough at retirement, you deserve to struggle when you get there. Now, I went to Oxford, and what makes an Oxford and a Cambridge education kind of unique, is that there’s an underlying philosophy, that you almost can’t hold a strong opinion unless you’re able to argue effectively for both sides of the argument. And so when we … when I first started writing my essays … I was a mature student, and when I first started writing my essays, I’d fail them because I’d argue a point from a particular perspective. And the professor eventually sat me down and said, “No, you need to be able to argue both opinions equally succinctly, equally logically, equally dispassionately before you’re allowed to choose a side of the fence.” And it’s a fantastic discipline. 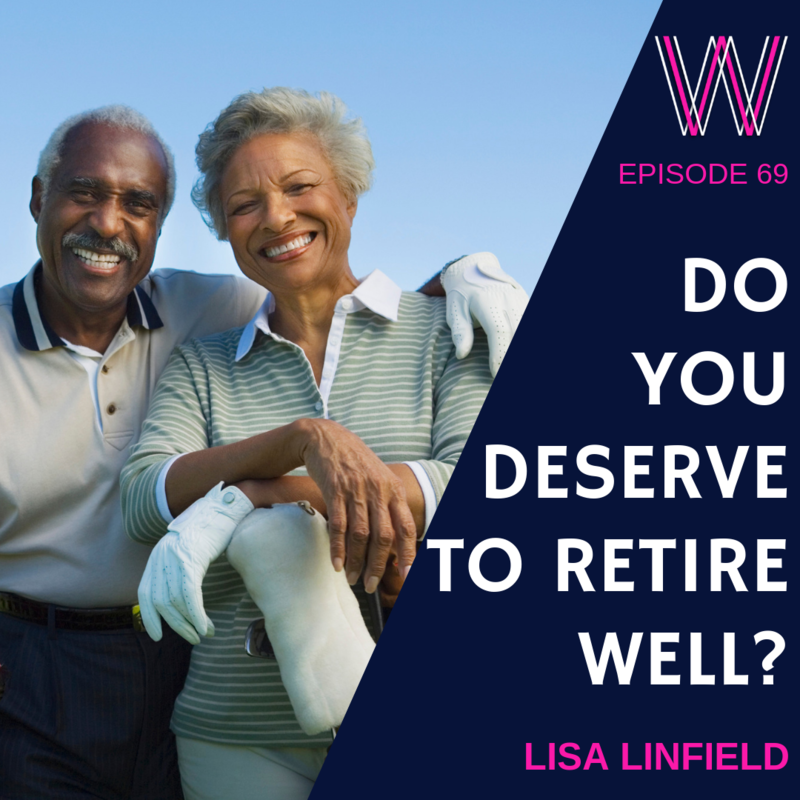 So I thought a lot about this question as to this whole thing of having enough money when you retire, and do you deserve to retire … So I thought a lot afterwards about having enough money to retire, and whether or not one deserves the position we’re in. So some people work really, really hard and they get to retire really, really well. Other people work really, really hard and they don’t get to retire very well. And so I kind of have been thinking the last five days about this, and decided to put forward to you, as my audience, the different kind of sides of the argument that I came to. So, let’s start arguing against that. Let’s say that, if you don’t have enough for retirement, it’s not necessarily because you deserve to be there, to be in a position of struggle, and there are actually many arguments for this. In fact, there are many more arguments than on the other side of the fence. One situation is, if you have your own business, and your business goes bankrupt, sometimes that’s because of bad management, but sometimes it is extenuating circumstances. Someone very close to me lost their business, when in South Africa the interest rate went from 10% to 25% in a very short period of time, which effectively means that your cost of servicing debt almost triples. And if you’re working on a certain size of debt repayment, or interest payments, it can really cripple a manufacturing business for example, where a large portion of the machinery is on lease agreements that have interest rates attached to it. So, that is definitely a situation where, through no real fault of yourself, a government change in positioning can lead a really tough interest rate position that can really put your business under. The next argument that I came up with was one that I see so much in my business, and it upsets me enormously, and is one of the big underlying … or one of the many, but a big underlying for starting Working Women’s Wealth, which is where women in their late 40s, 50s even 60s, find themselves in a position where their husbands divorced them, and they have given up their job, and their career to raise children. And they have agreed as a unit, as a partnership, when the kids are young, that in the interest of the family, it’s better for them to give up their job so that they can look after the children and free up the husband to focus entirely on work and bringing in the money. And we all know that for many of us, it’s a lot easier actually to work than it is to spend time with young kids, because they’re highly demanding, and so it is a real free up of time and space that the husband’s career can continue. And then what happens is that, the kids turn 18, leave the house, and then for whatever reason there’s a divorce. And many times the distribution, or the split of the assets is not equal, and the wife ends up not walking away with enough money to survive. And also, that first phase of your life, for many people, they don’t get to save as much as that they would then save in the next phase of life, in the kind of 50s and 60s when there’s not the same expenses. So there isn’t that much money to split sometimes, but she goes on to struggle because she’s stepped off the career ladder, and he continues to blossom. So they get to a stage of similar age retirement, she doesn’t have as much as he does, mostly because she cannot jump back at the same trajectory after 20, 30 years out of the workforce as he can staying in the workforce. And it’s what I’m hugely passionate about, because I see it so many times, is that in the phase of a divorce people forget that they made this agreement together. So that’s definitely a case where there may not be enough money for retirement. The next case I was thinking about was, one that I’m actually … I debate a lot inside myself, and it’s when people get to retirement, and they don’t have enough because they’ve given up everything for their kids. And there are, I think, a range in terms of this response, as to whether … what is right, what is wrong. Or, not necessarily what is right, what is wrong, but there’s a range in terms of this problem. And it ranges from a survival mode, where literally you have given up everything for your kids, and I see that a lot, specifically in the lower incomes. And then there is almost an ego element to giving up everything for your kids, that it’s when your kids become an extension of you in terms of your own self-image. So for your kids to have this unbelievable jet-setting life, et cetera, gives you a lot of kudos within yourself. Now, on this extreme side where you really have given up everything, and our helper who works for us has given up everything in her life for her children, she definitely is in a position where I think she doesn’t deserve to have a hard retirement, because she truly has not made enough through her entire life, and everything she has made has been given to giving her kids a better education. But then there are people who I see, who I know are going to struggle, and part of the reason they’re going to struggle is because they have ended up really over giving to their kids. And there’s obviously a huge range in the middle, where everyone of us sits that are parents, because as parents you want to give your kids a better life. So the other one that’s in a similar line to that is, when you do end up supporting your elderly parents, and this is one of the challenges when you have … when your parents haven’t saved enough for retirement. And again, the response here seems to be two-fold, which is, if your parents have given up everything for you, you graciously support them. And if they haven’t, if they have spent all their money, then it’s a really difficult thing. But either way, it ends up that money that you could have been saving for your own retirement goes to paying for your parents. So then let’s argue on the other side. So let’s argue and debate the question for, when is it that almost one deserves to not have enough money, or when is it the position where actually it is your own fault? And that is often when it comes down to the fact that you are living way beyond your means. For example, if you’re up sizing your house at every opportunity, if you’re up sizing your car every three or four years, if you’re up sizing your holidays, if you are trying to keep up with the Jones’, that’s the real challenge where you’re living a fantastic life now, but you are not getting to the position where you are able to actually save for retirement because you’re spending everything. And it really is a challenge that I put to all of you, which is that, if you are finding yourself in this position, and you aren’t living what I’d call a frugal or a careful lifestyle, then there does come a position, or there may come a time when you’re reliant upon your children. And that is something that I really want us … or, I urge us all to be mindful of, is for you to live financially independent until the day you die – so you’re not reliant upon your kids or anyone else, is the greatest gift you can give your children. It really is, because it is a hang of a thing if you as a child are trying to give the best for your children in terms of their education and their life, and suddenly that needs to take a big step backwards because you actually have to feed and clothe your parents and pay for their accommodation. So it is something that I urge you, in terms of your kind of long term thinking is, if you’re not putting enough aside for your retirement, because you’re going on big holidays or you’re driving big cars, then you stand to really put some huge pressure on your children as they go through their life. And then there was as case that I was in the middle of that I didn’t … I couldn’t put on either you deserve or you don’t deserve, and it comes down to education. And there is a huge of amount of education needed for all of us on what it takes to retire, how much money you need, how do you manage it, all of that stuff. There’s a huge amount of education. And the reason why I’m kind of in the middle is because, these days you can educate yourself without needing to pay a single human on almost any aspect of what it takes to retire. Whether it be through podcasts or downloads, or courses, or anything, there has never been this much information available in so many different forms. So not like the old days when it was just textbook type learning. You have videos, you have infograms … Sorry, in so may different types of forms, there are videos, there are blog posts, there are infographics, there is just podcasts, everything. There is so much information that if you really want to know the question of how much money do you need, it’s available. In my … In episode 67, two episodes ago, I did one financially independent, retire early. And it gives you literally the rule of thumb, depending on where you live, as how much money you need. Now, you can get a more specific thing, but that at least puts you in the right ballpark. And then, if you’re in debt. If you can find anyway to get out of debt, I’ve got episode 63, but there are so many different resources on getting out of debt. And it comes down a lot of the time on the assumptions that we’re making about money. And in episode 26 when I talked about this, it truly is the most important thing that you can ever do, is spend five, ten minutes with a journal and say, “What am I assuming about my own retirement?” And when it comes down to that is, “Well, I’m contributing every month to a work based retirement funding scheme, and therefore, they’re taking what they need.” And it is the biggest wrong assumption you can ever possibly put in your head. And so, go back and listen to that episode if you’re relying on the assumption that there’s an employee retirement fund. If you’re relying on the assumption that your husband is going to sort this all out, again, it’s a huge amount of pressure to put on one human. Go and find out for yourself if you have enough. And the last one in terms of education comes down to this whole thing, that it has never been easier to make more money than it is currently now. And I’m not talking about going and flipping burgers, going and doing other things. In this online world there are so many different things you can do to earn a side amount of income if you find yourself in the position where you’re not able to save because you’re just struggling to make ends meet. Or, where you’re taking money from your savings to go on holiday. Or, when you’re in a position that you are needing to earn more money just because you started too late in terms of saving for your retirement. So I really urge you to take me up on an offer I’m about to make you, which is that having decided to sell a bunch … So I really urge you to take you up … So I really urge … So I really urge you to take me up on this offer that I’m about to make you, which is that I wrote a blog post, How to earn $1,000 sitting on the couch. And it has literally nine different ways from doing surveys, uploading your own photos onto … your selfie photos and other photos from your camera onto sights that you can make money from, to … it has nine totally different ways that you can earn an extra income sitting on the couch. And I found that people were reading the article saying, “That’s great,” but weren’t taking any steps to do it because they didn’t know how to do it. So I made a seven video series on how to earn more money, and I literally show you on the computer screen. You watch me sign up to do online questionnaires, or test websites, so all of this. It is absolutely there and available, and I was going to sell it, and I have sold some of it, but I’ve made a decision that for me it is so important that people have this information, that I’m going to give that video series for everybody for free from now onwards. So I urge you go onto this episode on the workingwomenswealth.com, and sign up for those free videos and for the infographic download that takes you through all these different ways that you can make extra money. Why? Because I’m passionate about this problem that we’re facing as a society, about the fact that our parents are not going to have enough money so we’re going to have to support them, and our kids are going to have to support us. And it’s a problem that I think is going to have massive social ramifications all across the world. So there is no reason you can’t earn extra money sitting on the couch. Please take me up on the offer, go to the website and download your free version of the video series, the infographics, and the words. So you’ve got it in words, you’ve got it in pictures, and you’ve got it in videos, so that however your learning style is, you can earn extra money sitting on the couch. Take care, have a great week.